In this first in a five part series, Mary Lynn Mathre of Patients Out of Time expounds on the importance of education regarding our own endogenous Endocannabinoid System. 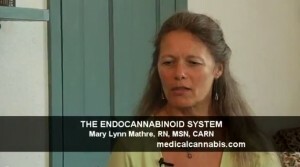 In the second part of this series, Mary Lynn Mathre discusses the primary role of the Endocannabinoid System, homeostasis or "Balance". Science has shown that this system not only exists in humans, but in all mammals, regulating virtually every function. For more information about the Endocannabinoid System, visit our Patients Out of Time ( http://medicalcannabis.com ) website. Mary Lynn Mathre discusses the remarkable way that cannabis can "Synergistically" work with other medications. She also touches on pain clinics and how their ignorance of the Endocannabinoid System often causes unnecessary pain and suffering for many chronic and terminally ill patients. In Part 4 of this series, Mary Lynn Mathre addresses the question, "What about our children? As she continues her discussion of the Endocannabinoid System, she also addresses cannabis as food and a very vital, natural supplement. I am Carylon Bruly, from Ohio U.S.A who suffer from lungs cancer, basically a Death Sentence on my life and i thank you guys for your prayer and concern toward my life and i pray for God to be with you guys and thanks to the Doctor who God has sent to help me cure the terrible illness. The thoughts of having lungs Cancer burns and itches simultaneously in my heart that i was dead alive. I heard that Hemp Oil could help, and for the price i was willing to try anything that would save my My Life, what I found out was astonishing! It was instantly getting better and better after 60 days of using and most of the virus are gone and just little medication left for me. I am very grateful to Doctor Nathan Kisper for Selling the Hemp Oil for me and his Medical Advises, for all those that have problems with Cancer Please Please Kindly let the Doctor Know, he will help you with all you need to cure your cancer, he is trust wealthy and sincere.